Ministerial Island is located in Casco Bay between Stave and Bates Islands about 1½ miles east of Great Chebeague Island. As Ministerial is primarily a marine wildlife habitat, public access is not permitted, although the scenic character can be enjoyed from the water. To protect and preserve the natural, substantially undeveloped character of the island, especially its seabird nesting habitat for eider ducks as well as black-backed and herring gulls. At less than 25 feet above sea level, Ministerial Island is low-lying with a shoreline characterized by a few sand and gravel beaches and rocky ledge. It is connected to Bates Island by a low tide sandbar. The interior is partially open grassland and partially covered by herbaceous shrubs with other low vegetation. There are few trees. Part of the island is developed with a small, rustic house and other structures for seasonal use by its owners. A few footpaths traverse the property. The island may have served as pasture for livestock in the nineteenth century. Having changed hands a few times since the early 1800s, Ministerial has been owned by the same family since 1941. They have kept the island in relatively pristine condition and sought to impact its natural state as minimally as possible. 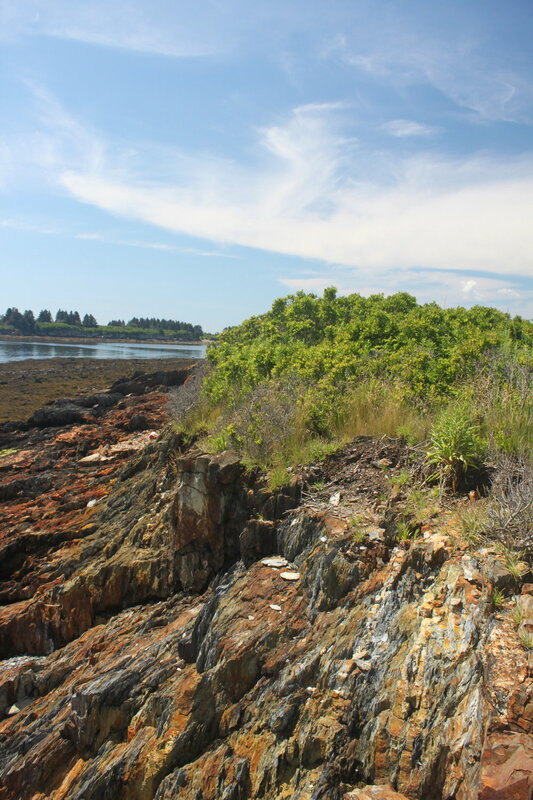 Portions of the island have grown back into woody shrubs such as northern bayberry, common elderberry, speckled alder, wild rose, and staghorn sumac. Patches of hay-scented fern can be found. Some Asiatic bittersweet is present, but not dominant. Other herbaceous plants include St. John’s-wort, sedge, sheep sorrel, goldenrod, and milkweed. Low-growing tree species include gray birch, red maple, red oak, and pin cherry. Marine birds that can be seen are common loon, blue heron, osprey, snowy egret, herring and black-backed gulls, eider ducks, and cormorants. Songbirds include song sparrows, common yellowthroat, Baltimore oriole, grey catbird, and prairie warbler. Clam flats are visible at low to mid-tide.